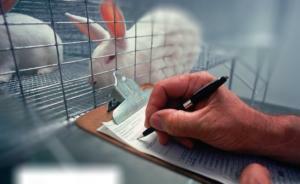 Animal Testing - Bad or a Necessary Evil? Of all topics to discuss amongst animal lovers, I know that animal testing is perhaps the most contentious I could choose. Depending on who you ask, the subject of testing pharmaceutical products on animals will provoke different responses in them; on the one hand, medical professionals will passionately defend the use of animals in scientific research, citing the numerous medical breakthroughs made possible by experimentation in the last decade (penicillin, insulin, the tetanus vaccine etc), while others will question the necessity, effectiveness, and ethics of such a largely-hidden and controversial practice. As an animal lover, I was hoping to find a reasonable degree of justification for animal testing in my research, and was amazed by the amount of defence out there! Just as many people seem to support the use of animals in medical research as they do oppose it. That is not to say I believed every ‘fact’ and statistic I read, whether in favour of this kind of medical research or against it, but it definitely improved my understanding of animal testing in this country and changed the way I look at it. For a start, I wasn’t aware that any form of cosmetic testing on animals is illegal in the UK. Reassuringly, nothing I read that supported medical research using animals condoned their use in cosmetics testing. Across the Atlantic the same cannot be said, but fortunately here at home, no animal is subjected to the degradation and torment of product application, whether make-up or other known toxins and irritants, which shape our ‘beauty’ industry. I also wasn’t aware that we share 98% of our genes with a mouse, supporting why 97% of all UK animal research is conducted on mice and rats. While we might be more closely related to primates in terms of our genetic composition, sensitivities and intelligence, testing on monkeys is thankfully also illegal in this country. Other than rodents, animal research in the UK centres mainly upon fish and birds. While this doesn’t make it right, when you think that every year the UK consumes 300 times more fish than has been used in medical research over the past two centuries, the scale of testing does not seem so horrendous. I also read somewhere that domestic cats kill as many animals (namely rodents and birds) in a week as UK animal testing uses in an entire year. Of course, none of these numbers and statistics account for the way that animals are used in research worldwide or the amount of suffering they go through to better our understanding of human anatomy and disease. Examples of animal testing or animal cruelty as it would be classed outside the laboratory are easy enough to find, and we are surrounded by images of mutant animals that have been genetically engineered to develop cancers, sprout additional body parts on their backs, or endure abuse and invasive procedures. Many animals are intentionally paralysed, exposed to extremely harmful chemicals, torn from their mothers after birth and force-fed potent pesticides and medications, while more heinous examples include brain drilling, electric stunning and deliberate water deprivation. The unfortunate animals that wind up in medical research laboratories are physically harmed, socially isolated and psychologically stressed in the name of science. The same science that has eradicated Smallpox from the planet saving millions of lives, developed the insulin needed to support 450,000 people living with Type-1 diabetes in the UK, and provided us with Herceptin, a protein used in the treatment of certain types of breast and stomach cancers that continues to enhance the lifeline of many sufferers. While many of us will abhor animal testing on the grounds of its limitations and inhumanity, the likelihood is we will all have benefited at some point from medicine that was originally tested on animals. Nobody likes animal testing, but is it not a necessary evil? Many will say no, there are alternatives. Although these are not well known, the alternatives range from in vitro methods using human cells and tissues, to the use of sophisticated computer models that are designed to simulate disease progression in humans. Enough argue these methods are actually more relevant to human health (testing toxicity in human tissue is more accurate than testing animal tissue) and can benefit medical advance in ways that animal testing falls short. Kathy Archibald, Director of Europeans for Medical Progress, summarised her thoughts by describing animal testing as "less predictive than tossing a coin." ‘Microdosing,’ brain imaging and the use of medical training systems such as TraumaMan – a life-like, bleeding and breathing human model, used to teach surgical procedures in an emergency, are further alternatives to the invasive use of animals in medical research. While the testing of some pharmaceuticals may require the use of animals to a point, there are clearly substitute methods to reduce the numbers that are used. In many cases, these alternative methods are more practical, cost-effective and produce less environmental waste. The arguments out there are completely at odds with each other, and whilst I don't support animal testing, I can't definitively condemn all aspects of it either. While I find cosmetic testing deplorable, I know I have probably used products in the past that have been tested on animals, just as I know I have benefited from certain medicines that were developed through experimentation on animal subjects. Professor Chris Higgins, Director of the Medical Research Council Clinical Sciences Centre, said in 2009 that "although nobody likes the idea [...], if it comes to a choice between regulated studies on a few animals and a treatment for an incurable disease affecting hundreds of thousands of people, most people will make the same choice." It is hard to say where any of us would stand on the matter if we had to call upon science to find a cure for a loved one's illness that required the use of animals, but for now, I think I remain firmly in the 'find an alternative' camp. What about you? Have an opinion about animal testing? Please share it with readers below!